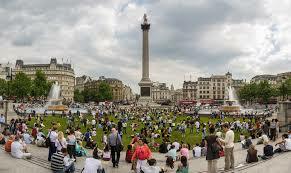 Trafalgar Square in London: To go to Trafalgar Square, nearest tube station is Charing Cross. It is located right next to the underground station. The Trafalgar Square which is one of the most famous squares in the world is located in Central London was constructed in the mid-1840s after the Naval Battle which took place in 1805. This place is owned by the Queen in the Right of the Crown and is managed by Greater London Authority. 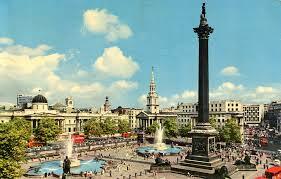 The Trafalgar Square is one of the major tourist attractions of London. To the west of the Trafalgar Square lies the Canada House while in the northeast corner lies the Church of St Martin’s in the Field. The center of the Trafalgar Square consists of Nelson’s Column which is 170 foot high with four bronze lions guarding its base. Apart from this, the place also boasts of sculptures and statues which are on display. There are four pedestals located at every corner of the square: two in the north which are larger in size than the southern ones. Three of these plinths have statues of George IV, Henry Havelock and Sir Charles James Napier in the northeast, southeast and southwest direction respectively. The fourth platform was originally intended for William IV, but due to the insufficiency of funds, the same could not be raised. The other statues in the square are those of James II, George Washington. The Trafalgar Square is used for a variety of reasons ranging from carrying out Political demonstrations to celebrating New Years or Christmas. Since 2005 on every New Year there is a spectacular show of fireworks on the London Eye and southern bank of the river Thames which is a visual treat for the eyes. Since 1947, as a matter of ritual, even Christmas celebrations take place in the Trafalgar Square during which the Mayor of Oslo comes to London to light up the Christmas tree. 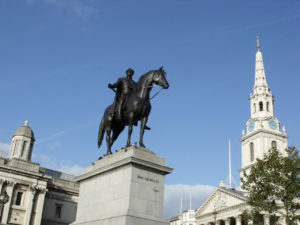 The Trafalgar Square is also used as a venue of celebration for all the people traveling from all over the country to London on 8th May every year to celebrate the Victory in Europe Day (VE Day). Apart from this, the Trafalgar Square is also a popular choice for carrying out political demonstrations in spite of authorities banning time and again banning them. It is the beauty and enormity of the Trafalgar Square which makes it one of the favorite locales to shoot movies as well. Movies like The Avengers, Casino Royale, Man in a Suitcase and the Impress File etc are some of them to have been shot there. Additionally, a number of sports events are also organized here like for instance for the chess tournament, the Trafalgar Square in London as well as in Moscow was used wherein the pieces and pawns were made out of ice in which some of the structures resembled some of the landmarks of both the cities. In May 2007, over 2000 sq meters of the square area was cultivated grass as a part of promoting “Green Spaces” in the city carried out by the London authorities. 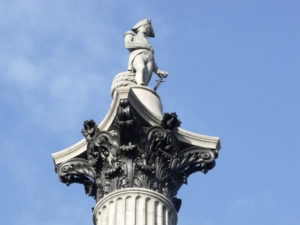 Every year as a mark of remembrance of the Battle of Trafalgar on 21st October, a parade is held in the honor of Admiral Nelson who is said to have been buried in St Paul’s Cathedral.